Top Contributors - Laura Ritchie, Bert Lasat, Bruno Luca, Jona Van den Broeck and Saeed Dokhnan - Your name will be added here if you are a lead editor on this page. Low back pain can be defined as pain or discomfort in the lumbar region. This can be unilateral of bilateral. In 85% of patients, low back pain is non-specific, meaning there is no specific medical diagnosis for the pain. People with weak muscle strength and endurance are at greater risk for low back pain. It has been shown that weak trunk extensors may lead to chronic low back pain. Being overweight is also a suggested risk factor but some studies do not support this. Therapy for lumbar instability must address not only the lumbar region but also the surrounding anatomical structures such as the muscles of the abdomen and lower extremities. The kind of exercises depends on the status of the patient. Clinically Relevant Anatomy of the low back. There are different reasons why we might give stabilisation exercises to patients with lumbar instability. The most important considerations are our treatment goals and the likelihood of a positive response to treatment. An important study by Hicks et al shows that during the examination of lumbar instability positive and negative determinants can be found indicating whether a subject will benefit from a low back stabilization program. 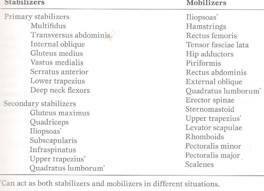 There are indications that stabilization exercise programs are used to improve the strength, endurance and/or motor control of the abdominal and lumbar trunk musculature. Stabilisation exercise programs exist of general exercises, educational and workplace-specific back school classes, increase of workload tolerance, psychological interventions and segmental stabilization exercises. The stabilizing exercises focus on the re-education of a precise co-contraction pattern of local muscles of the spine. It had been shown that stabilizing exercises along with routine exercises help with the reduction of pain intensity while increasing functional ability and muscle endurance. Stabilizing exercises are therefore recommended in the treatment of patients with lumbar segmental instability. 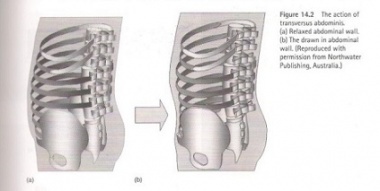 • Use repeated movements of lumbopelvic region, in non-weightbearing positions initially, to improve position sense. • At a later stage it may be necessary to add in specific muscle-lengthening techniques for non-weightbearing muscles, especially if the muscle tightness is in the passive rather than the active elements of the muscle. The three stages of the exercise model form the building blocks for the development of the joint protection mechanisms, for both low- and high-load functional situations. Each stage includes clinical assessments of the level of impairment in the joint protection mechanisms, followed by the suggested exercise techniques. Optimal spinal stabilization can be achieved by strengthening the deep back and abdominal muscles. These include the transversus abdominus (TrA), quadratus lumborum, oblique abdominals, multifidus and erector spinae. 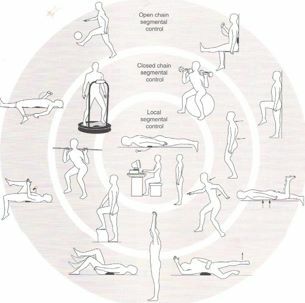 Exercises targeting these specific muscles should be done in a progression, usually beginning with TrA which provides the patient with initial stabilization that is helpful during subsequent exercises and daily activities. Normally TrA should be in a state of continual contraction whether in standing and sitting, facilitating good posture. In patients with low back pain, TrA can become deactivated, leading to an unstable core but additional global musculature may also be co-contracted in an effort to regain some control. Goal: Facilitate active pelvic tilt. (d): Faulty lumbar-pelvic rhythm often shows up when lumbar flexion and posterior pelvic tilt occur immediately. Goal: Use a pelvic tilt action to move the spine forward and backward. Once you can perform pelvic tilting well, you should combine it with classic hip in a hinge action where the trunk moves on the hip in a hinge action and the spine remains straight. Avoid any increase or decrease in lumbar lordosis! Goal: Teach anterior-posterior pelvic tilt control. Sit on the ball with knees apart and feet flat on the floor. Both hips and knees should be flexed to about 90°. Tilt pelvis alternately in both anterior and posterior directions, making sure the shoulders and thoracic spine remain inactive. Start with small ranges of movement. Goal: Teach clients to learn to use the multifidus at will and seperately from other muscles. The multifidus is the most important stabilizer of the spinal extensor group. People with low back pain often lose the ability to contract this muscle and do not regain the ability spontaneously. Bulge the muscles beneath the fingers of the therapist and differentiate between erector spinae contraction(more lateral) and multifidus contraction(more central). To differentiate between the multifidus muscle and the erector spinae muscle, it’s recommended to contract the erector spinae muscle by hyperextend the trunk. To contract only the multifidus muscle, the patient may not hyperextend the trunk. 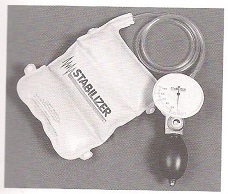 A movie of this exercise is shown inspinal stabilization. Goal: Encourage your client to contract the multifidus and lateral abdominals simultaneously. Client sit on the edge of a bench with his feet on the floor. 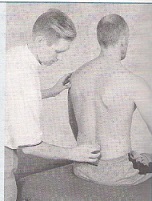 Lumbar spine in neutral position. Self-palpate the L4-L5 level by placing the thumbs on the lower lumbar spinous process and moving them outward slightly into the spinal tissue. Place the weight onto the front leg and then onto the back leg alternately. Goal: Place minimal but progressive limb loading on the trunk. This exercise is described in core stability. Goal: co-contract trunk stabilizers with gluteals. Goal: progress from bridge from crook lying. The patient starts in crook lying ,then he lifts one leg. A movie of this exercise is shown in lumbar spine fracture. Goal: control the quadratus lumborum and lateral fibers of the oblique abdominals. A movie of this exercise is shown in low back pain and pelvic floor disorders. Goal: progress from side-lying spine lengthening. Goal: teach pelvic control and stability in single-leg standing. Shift the pelvis to the left, lift slowly the right leg. The supporting leg supports the pelvis and the pelvis supports the back. Raise the knee no more than 45°. Goal: maintain pelvic positon against the pull of the hip flexors. Raise one knee, about 8 cm. Unload the limb by lifting the heel. If he is able to maintain good alignment, have him lift the entire leg. The following videos are examples demonstrating progressions of spinal stabilization exercises that can be used for patients requiring this technique. They can and should be modified according to specific patient needs, preferences, or functional demands. The physical therapist should remember to consistently stress the importance of maintaining a neutral spine when performing these exercises. Goal: Develop muscle reaction speed for back stability. Goal: develop rapid-onset back stability. Goal: advanced control of pelvic tilt. The patient needs to sit down on a wooden bench with the feets on the floor. Than hold the pelvis alternately in the anterior and then posterior direction. The aim is to isolate the pelvis and lower lumbar spine from the thoracic spine and the shoulders from the upper lumbar spine. Goal: build stability reaction speed in sitting. This exercise is described in low back pain and pregancy. Goal: strengthen upper and lower abdominals. Start position: lying trunk curl over ball. The patient should lift one leg while maintaining the stable position. Goal: Strengthen hip and trunk stability muscles by challenging stability with continuously variable overload from multiple directions. Start position: the standard bridge, his feets on a ball. The therapist pushes the patient against his pelvis from above and below and side to side. Goal: strengthen the spinal and hip extensors. Goal: Strengthen back and hip muscles while increasing leg motion control. Goal: Prepare the body for lifting while strengthening the legs to provide power for the lift. Start position: ball between back and wall. 1) Sitting position while rolling the ball down the wall. When he achieves 90° hip and knee flexion, the patient needs to hold the position. The patient sits on the floor with his legs extended. The patient can push with his/her elbow against the lateral side of the knee twist his/her trunk away to get more stretch. Goal: Work the abdominal muscles in general, with increased emphasis on innerrange activity of the upper abdominals. The patient has to perform a few slow hip extensions. The physiotherapist places one hand on gluteus maximus of the patient and one on the hamstrings for feedback. If done correctly, the therapist will feel the hand on gluteus maximus being pushed away before the hamstrings are activated. It has been shown that there is a relationship, especially in muscle coordination, between the muscles that stabilize the lumbar spine and the muscles in the lower extremity. These muscles therefore should be trained as well in order to further achieve a balanced and coordinated muscular system.The quadriceps also play a part in this relationship. A study has found that patients with low back pain have deteriorating function of the quadriceps, with reduced endurance and feedforward compared to normal. The study found that this is due to reduced quadriceps activation after localized lumbar paraspinal fatiguing isometric exercise. 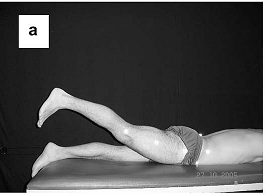 Exercises aimed at localized fatigue of the lumbar spine extensors have shown an immediate response in the lower extremity including reduced quadriceps central activation ratio deteriorated balance and response to a balance perturbation. Furthermore they describe a quadriceps fatigability during maximal effort isokinetic knee extension contractions. The two main functions of the quadriceps are extension of the knee and flexion of the hip. The patient starts with both his feet on the ground. The patient then straightens one leg and holds this position for about 10 seconds before switching legs. To make this exercise a loaded exercise, the patient can do this exercise with weights (for instance on a leg extension machine). Ask the patient to hold for 1-3 seconds. It has been shown that patients who are braced with an orthosis for lumbar instability benefit from some of the exercises described above. A study found that patients who were braced and did the following exercises had a decreased level of pain. Gluteal and ischiocrural stretching exercises performed in an unloaded way. 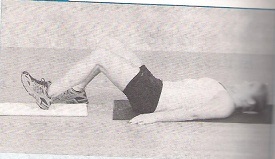 Contraction exercises of the lumbar stabilizing muscles, in particular TrA. Exercises for trunk stabilization on ever more reduced supporting surfaces and finally on unstable surfaces. Fritz et al. examined the predictive validity of lumbar segmental mobility in patients with LBP. It is possible that patients with segmental hypermobility were more likely to achieve clinical success with stabilization exercises compared with patients without hypermobility. It has been showed in the research of Hides et al. that the Lumbar Multifidus muscle remained atrophied after a 10-week period when patients with acute LBP did not exercise. But this muscle was recovered to normal size in patients who received a stabilization exercise program that stressed deep abdominal and isolated the Lumbar Multifidus muscle contractions. There are also indications that many exercises commonly used by physical therapists in LBP rehabilitation require low to moderate muscle activity of the Lumbar Multifidus and Longissimus thoracicus muscles. To increase the activity of these muscles during exercise, active or resisted lumbar extension is required. Resisted lumbar extension at the end range tends to maximum activity of these muscles. It has been showed that segmental stabilization exercise was more effective than placebo intervention in symptomatic lumbar segmental instability. The commission advises of a study that evaluated the effect of unstable and unilateral resistance exercises on trunk muscle activation revealed that, regardless of stability, the superman exercise was the most effective trunk-stabilizer exercise for back-stabilizer activation. The side bridge was the optimal exercise for lower-abdominal muscle activation. Thus, the most effective means for trunk strengthening should involve back or abdominal exercises with unstable bases. Furthermore, trunk strengthening can also occur when performing resistance exercises for the limbs, if the exercises are performed unilaterally. On this page there are a lot of exercises. To be sure the patients stays motivated it’s important to take care of variation in the exercises you give. It’s possible using this page to vary your therapy for patients with low back pain. The effects of Gyrotonic expansion system exercise and trunk stability exercise on muscle activity and lumbar stability for the subjects with chronic low back pain.